On Easter Day we climbed some 1,600 feet by mule and foot to the 14th-century monastery of Ashetun Mariam. There was a biblical feel to our little procession as we made our way out of the town of Lalibela. It was a feast day of the Blessed Virgin Mary, and we walked alongside pilgrims swathed in their white gabis accompanied by the inevitable hangers-on associated with tourists or faranji as they are known. As we climbed we stopped every so often to look back at the naturally protected shapes of the celebrated rock-hewn churches; it was an epic scene. After visiting the monastery we joined the pilgrims who were enjoying some locally brewed honey wine. Later that day we were served a rather more palatable and visually appealing freshly prepared juice of mango, avocado and banana, all for the princely sum of 90 pence. 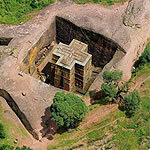 The eleven Lalibela churches, whose construction was orchestrated by King Lalibela at the end of the 12th century, are one of the main attractions in Ethiopia. They have world heritage status and took some twenty-five years to build. What makes them so remarkable is the fact that they were in a sense freed from the rocks and are beautifully and expertly carved. When you stand in front of the first one you find it difficult to comprehend fully the sheer endeavour and skill it must have needed to hew these buildings out of a single piece of rock. This is Africa’s Petra. Given that this is a Unesco site it is surprising there are not more tourists. I suspect this will gradually change as Ethiopia shakes off its reputation as a famine-stricken country and benefits from more political stability. 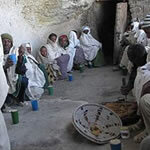 But one thing is for sure: at religious festivals there are thousands and thousands of Ethiopian people at Lalibela, many sleeping on the ground. This is a deeply spiritual country and mostly Orthodox Christian in the north. Our guide, Moges, had spent a good few years shining shoes in order to pay for his room whilst at secondary school. The majority of the children attending school here are from rural areas; their families have little or no money and survive by bartering produce at the local markets which are dotted about the rugged countryside. Morges was lucky, because a tourist sponsored him to attend college where he learnt to be a tourist guide. The engaging sales patter and motivation shown by the teenagers if at times a little over insistent would I think be approved of by many business people here! Earlier in our tour we had seen some big country in the Great Rift Valley, a geographical trench that extends from the Red Sea down to as far as Mozambique. The Simien Mountains National Park is on the northern edge of the Rift and easily rivals Kenya on the dramatic scenery stakes. Endemic species such as the Ethiopian wolf, walia ibex and gelada baboon may be seen here. 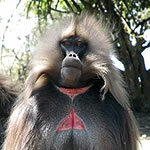 The latter you are sure to see in large numbers, and how it acquired its other name – the bleeding heart baboon – is self-evident from the picture. A big male, with its thick mane, waist length cape of dark fur and handsomely tufted tail, looks in part like a lion, but fortunately you can walk up to them with impunity whilst they eat the grass around you. 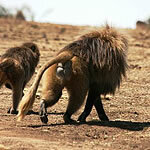 They are the only surviving species of grazing monkey in the world. It must be said that there are few luxury hotels in Ethiopia and so the focus needs to be on what you are going to see rather than where you are going to stay! Apart from those fresh juices, traditional Ethiopian food always involves an injera- a sort of grey pancake which you break off and use almost as tongs to scoop up your wot, a spicy meat or vegetable dish. Utensils are rarely used, and the mark of a native is that his fingers are never stained by the sauce. Don’t worry if this sounds a little unappetising, as there are also good pasta options; the Italians whilst never fully conquering Ethiopia did occupy it for a few years. 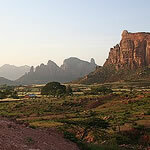 There are many more highlights to be seen on a tour of the historic sites in Northern Ethiopia and indeed the Rift valley. A full itinerary can be sent on request.